Louisville, KY (February 15, 2018) – With all eyes on Kentucky as the up-and-coming culinary destination, Bourbon Classic is pleased to announce the 2018 Cocktail & Culinary Challenge contestants and a partnership with Kentucky Proud. 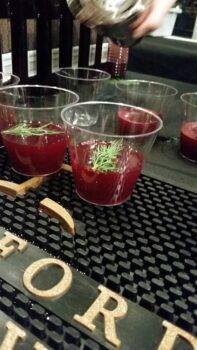 The Bourbon Classic Cocktail & Culinary Challenge presented by Kentucky Proud takes place Friday, March 2, from 7 – 10 p.m., at a new venue for the event: The Foundry at Glassworks. The event showcases classic and contemporary Bourbon cocktails paired with a chef’s Bourbon-themed culinary complement. Each chef will use Kentucky Proud products as a main ingredient, focusing on foods raised, grown, or processed in Kentucky. Attendees will have the opportunity to meet the contestants and hear them discuss their creations, chat with distillers and representatives about what makes the brands unique, and enjoy a tasting portion of each cocktail and small plate. A select panel of media personalities and industry experts will evaluate the cocktails and small plates individually and as pairings and select winners for each category.